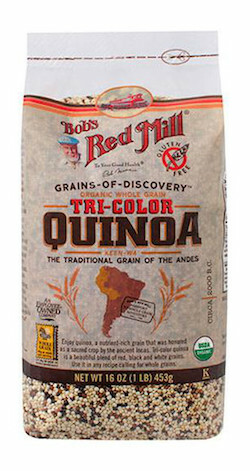 Organic Tricolored Quinoa is native to South America, is a pseudo-grain. It's actually a gluten-free seed, but used in cooking like a whole grain. Buy Quinoa online today. This amazing plant was domesticated thousands of years ago near Lake Titicaca, high on the plateaus of the Andes, and it was a mainstay in the diet of the ancient Incas. Multi colored quinoa is delicious on its own and in pilafs, soups and salads; the beautiful color elevates even the simplest dish. Our organic tricolor quinoa contains red, white and black quinoa and has been thoroughly rinsed and air dried to remove the naturally occurring bitter saponins. 100% whole grain, quinoa brings iron, fiber, and complete protein to the table.